Electron resonance scanner Medical microscope with an adjustable resolution on a submolecular level (VOY: "Scientific Method"). EM weapon Common type of weapon in the 22nd century, firing short light bolts (ENT). "EM weapons" may be an alternative name for the plasma weapons, whose light effect is visually identical. Emergency hand actuator Small crank or lever used to open doors aboard Starfleet vessels in the event of power loss (TNG: "Disaster", "Starship Mine"; VOY: "Year of Hell"). Emergency manual monitor Control facility in the upper level of the main engineering of Constitution-class starships, can be accessed by a gangway. 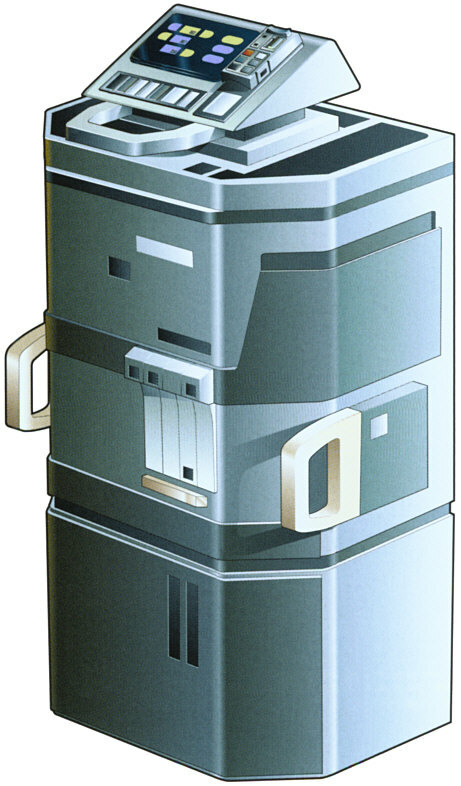 The manual monitor can be used to divert energy, to make other adjustments to the power system or to diagnose the transporter operation (TOS: "Mirror, Mirror", TOS: "I, Mudd", TOS: "The Lights of Zetar"). 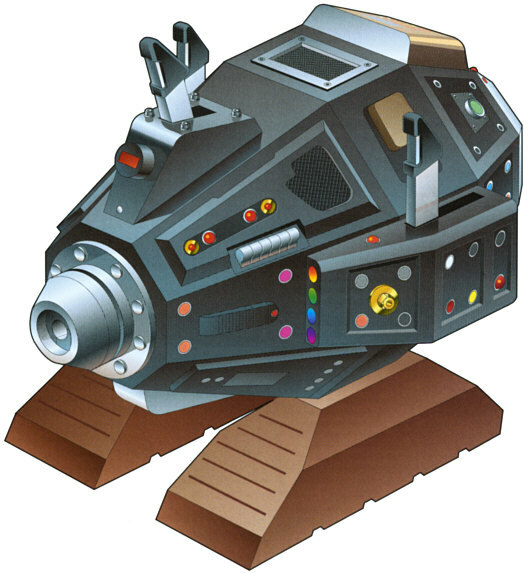 The emergency manual monitor was built for season 2, as a part of the modifications to the engine room. Emergency transmitter Portable communication device whose main purpose is to transmit a distress call across large distances (DS9: "The Ascent", "Waltz"). Emergency transponder One-way communication device that emits an identification signal on a certain frequency. Emergency transponders are used on away missions in order not to lose track of the away team and to allow a fast beam-out or other kind of extraction in case of a critical situation. Such a personal emergency transponder is very often a subcutaneous device (TOS: "Patterns of Force", TNG: "A Matter of Honor", "Who Watches the Watchers", VOY: "Emanations", "Faces", "Workforce"). The viridium patch that Kirk wore in "Star Trek: The Undiscovered Country" may qualify as an emergency transponder as well. Emergency transport unit Small prototype device designed for the one-time one-way transport of one person. There is only one copy as of 2379, built by Data and La Forge ("Star Trek Nemesis"). In other words, a typical example of a plot-driven device. 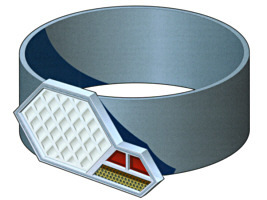 Emergency transporter armband Device used by Starfleet away teams to activate the ship's transporter remotely if a dangerous situation requires an immediate beam-out or if no verbal communication is possible (TNG: "The Best of Both Worlds", "Timescape"). In TNG: "Timescape" Geordi modifies armbands to shield the crew of the runabout against the temporal disturbance. EMH Acronym for Emergency Medical Hologram, a holographic replacement for a starship's medical officer. The EMH is a combination of a projection and forcefields, like most objects created on the holodeck (VOY, "Star Trek: First Contact", DS9: "Dr. Bashir, I Presume"). Being a projection without substance, the EMH seems to be inferior to replicated holocharacters. However, this way he is able to change between an opaque and a transparent state whenever required. EMH backup module Device storing a backup copy of a starship's emergency medical hologram (VOY: "Living Witness"). The backup module (not a part of the 29th century mobile emitter!) appeared out of thin air in "Living Witness", after other episodes like "The Swarm" had made a big deal of the inability to keep a backup. Read more in Computers & Communication. Emotion chip Extension to Data's programming devised by Dr. Soong. 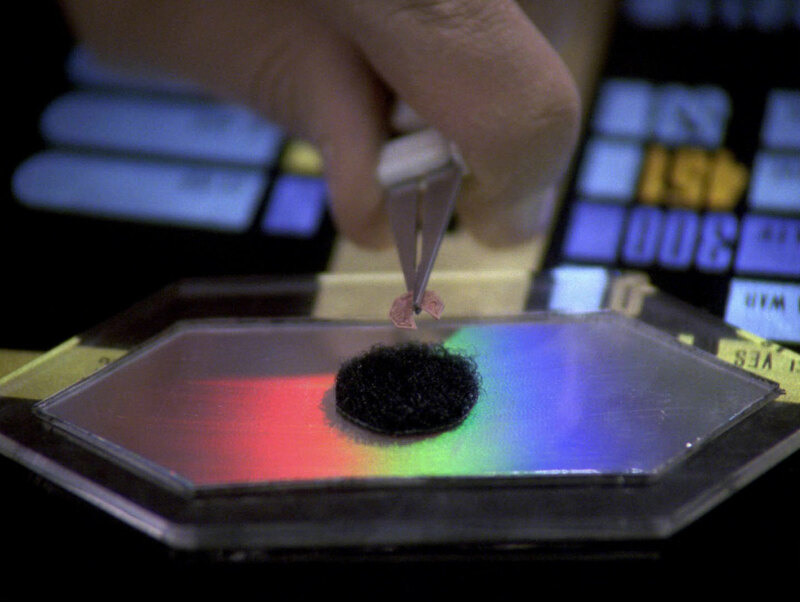 The emotion chip is supposed to compensate for the android's originally intentional lack of emotions (TNG: "Brothers", "Descent", "Star Trek: Generations", "Star Trek: First Contact", "Star Trek: Insurrection"). Emulator module Part of the computer system of Deep Space 9 that allows to form an interface with alien computers (DS9: "The Forsaken"). Encephalographic polygraph scan Brain-wave scan to determine the truthfulness of a statement -- a lie detector test (TNG: "The Drumhead"). Engineering section Also referred to as engineering hull, secondary hull or stardrive section, typically a distinct section of a Federation vessel in which the main power source and control (main engineering) is located (generic). Engram Memory stored in organic (brain) tissue. 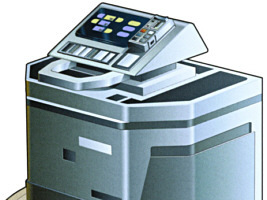 With the technology of several races of the 24th century it is possibly to isolate, record, erase and restore engrams (TOS: "The Ultimate Computer", DS9: "Sons of Mogh", VOY: "Ex Post Facto", "Cathexis", "Remember", "Workforce"). Engramatic purge Psychomedical procedure of the Mari to erase particular memories and patterns of behavior. It bears the risk or neurological damage (VOY: "Random Thoughts"). Environmental suit Protective garment worn in hazardous environments, to avoid radiation damage, contamination or infection (generic). 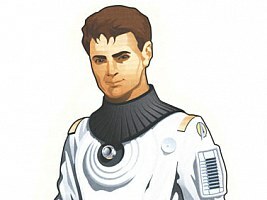 The first environmental suit can be seen in TOS: "The Naked Time". However, it is not a sealed suit (we can see when Tormolen puts off his gloves). The engineering personnel in the TOS movies is wearing environmental suits too, albeit without helmets. On other occasions in Star Trek there is not a fundamental difference between an environmental suit and a spacesuit (or EV suit), however. Environmental systems See life support. EPS Acronym for Electro Plasma System, the power distribution network used aboard Federation starships. Plasma is diverted throughout the ship to supply the warp drive and other systems such as SIF, life support, computers, shields or weapons (generic). Escape pod Small vessel that is released from a starship to escape its imminent destruction, also referred to as lifeboat. All recent Federation starships are equipped with escape pods, a Galaxy-class vessel has about 400 of them. Escape pods are equipped with RCS propulsion only. Some Klingon ships have escape pods too ("Star Trek II: The Wrath of Khan", "Star Trek: First Contact", DS9: "Valiant", "Penumbra", "The Changing Face of Evil", VOY: "Dreadnought", "Workforce", ENT: "Bounty", "The Augments"). 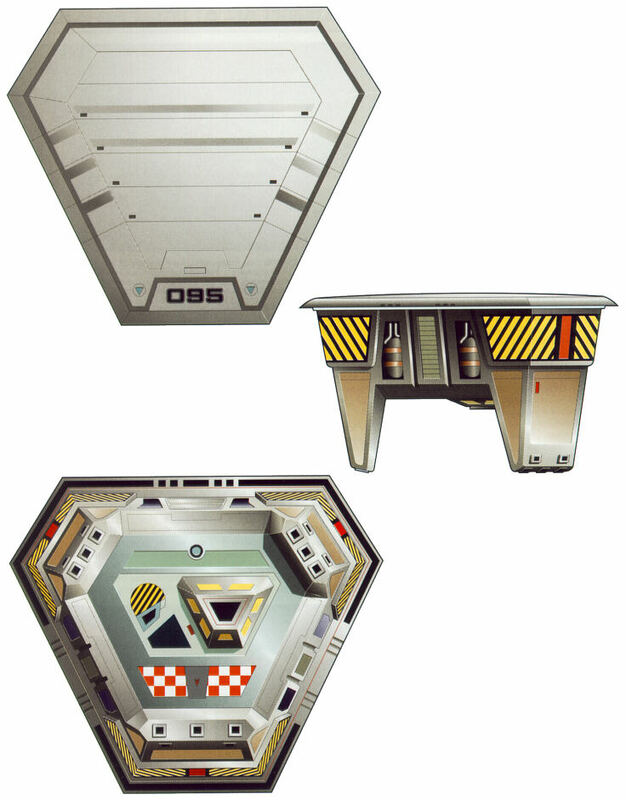 The escape pods can evidently be reintegrated into the ship, as it was shown for the Sovereign class (see image on the right) in "Star Trek: First Contact" and the Intrepid class in VOY: "Dreadnought". It is obvious that the escape pods do not offer a good chance of survival, in particular during a battle (DS9: "Valiant"). So evacuation is the last option in case the ship is out of control. This applies to starships in the same manner as with sea ships. The TNG Technical Manual refers to the Galaxy-class escape pods as "autonomous survival and recovery vehicle (ASRV)". If "escape pod" or "lifeboat" are just generic terms, an ASRV might be a specific, more advanced type. 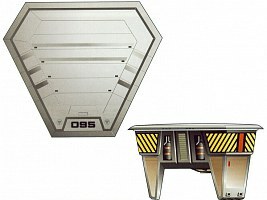 This would explain that ASRVs were first used as late as 2337, although previous starships already did have lifeboats, such as the Constitution refit (lifeboat sign in the cargo bay in "Star Trek I", mentioned in Kobayashi Maru simulation in "Star Trek II") and Constellation (mentioned in TNG: "The Battle"). Read more about lifeboats on early ships in the Starship Class Inconsistencies. The existence of lifeboats on Klingon vessels has been disputed as well. Read about Klingon Ship Classes. Escape transporter Small transporter of limited range built into a shuttlecraft (TNG: "The Best of Both Worlds, Part II"). Ethical subroutine Part of the programming of artificial lifeforms which allows them a distinction of what is ethically right and wrong (generic). Eugene's limit Theoretical limit imposed on warp propulsion systems. 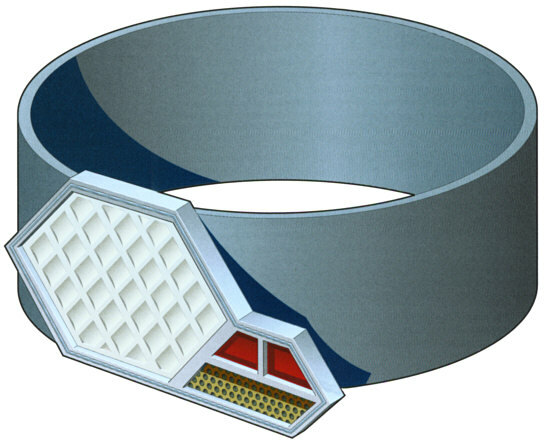 According to Eugene's limit, warp factor 10 cannot be achieved, since the energy expenditure as well as the speed would be infinite (TNGTM). Although Eugene's limit has never been explicitly mentioned on screen, its impact on all Trek incarnations since TNG is undeniable. It is named after Gene Roddenberry who introduced the Warp 10 limit for TNG. Although it was an arbitrary definition at first, Eugene's limit can fortunately be explained along with the peak transitional threshold in a way that a 10th layer of the warp field is not efficient and the complete remaining speed range is compressed between Warp 9 (9 layers) and Warp 10 (infinite speed). Any mentioned warp factor of 10 or more that seems to break this rule is actually attributed to a different definition of warp factors (either the old TOS scale or the future scale in TNG: "All Good Things"), where the latter might be connected with a new propulsion technology (transwarp). 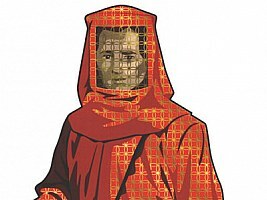 In essence, Eugene's limit expresses the impossibility of achieving infinite speed, and this fundamental principle has been violated only in VOY: "Threshold". Infinite speed is impossible, irrespective of the employed propulsion system and probably also for Q-like beings. Considering that there is nothing beyond infinite speed and therefore no threshold to cross at Warp 10, even the title of this episode is wrong. This is what Rick Sternbach says about "Threshold" in his newsgroup (posted 17.03.99): "I think what may have happened with the silly Warp 10 episode was that there was a coupling of the energy from the shuttle to all of the energy *and* matter of the universe (which might be possible if we're looking at a finite system), and the shuttle was able to access any point anywhere by some amazing tunneling phenomenon which shrank the normal 3D distances to points, much like all the universe being squished into a pinpoint at the big bang because it was all energy with no need for elbow room. Whew." 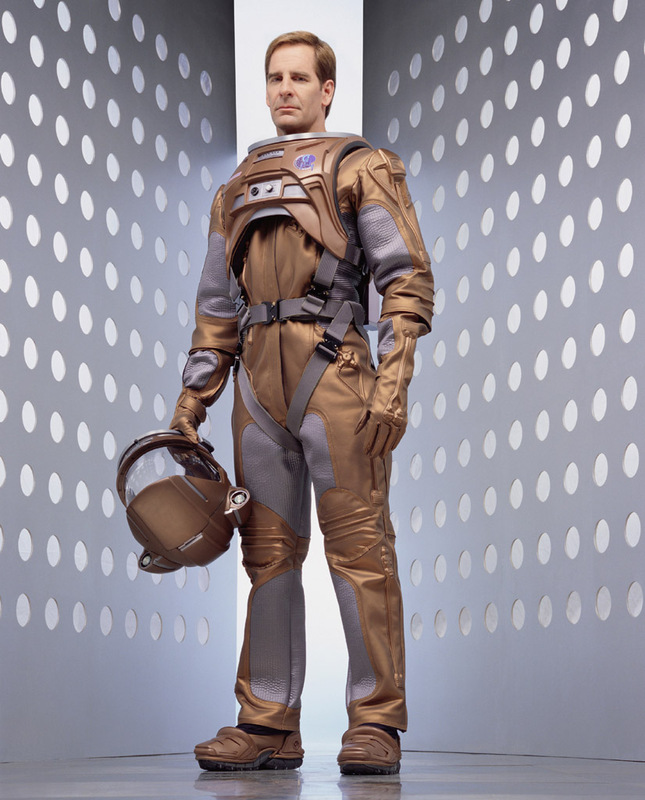 EV suit Special garment for extravehicular activity, common name for a spacesuit in the 22nd century. 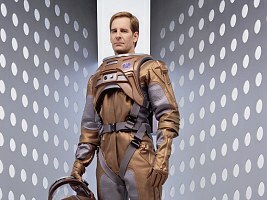 Starfleet's EV suits are self-sealing in case they are damaged. Spacesuits are needed more often than in later centuries where extravehicular activity is usually not required due to the high degree of automation (ENT). It is also possible that EV denotes "environmental", but I think "extravehicular" is more plausible, seeing that it is the common spacesuit. Evasive pattern Predefined tactical starship maneuver to escape an attack (generic). Event horizon Spherical boundary around a black hole inside which any form of mass or energy is inevitably trapped, unless it can move faster than light (VOY: "Parallax"). A hypothetical event horizon can be assumed and calculated for any mass value. It is possible to survive within the event horizon at least for a few seconds, provided that it is a huge black hole with about a million sun masses. A person crossing the event horizon in a starship would notice nothing but a distorted view of the outside world at first. However, while falling towards the center, the starship and its passenger would be virtually stretched and finally torn apart because of the strong gravitational force gradient. An external observer outside the event horizon would perceive the starship and its passenger move slower the closer they get to the event horizon, corresponding to a time dilation. Eventually, they would virtually seem to stand still exactly on the edge of the event horizon. Anyway, the starship would become invisible to the observer because of the red shift of outgoing radiation. More can be found in Real Physics and Interstellar Travel. The description of the real-world phenomenon is not consistent with the effects shown in VOY: "Parallax", where a lot of silly technobabble, but hardly any serious science was involved. Exobiology Science of alien life (TNG: "Encounter at Farpoint", "The Host", VOY: "Nothing Human"). Exocomp Small robot designed for multi-purpose tasks in hazardous environments. Exocomps are equipped with microreplicators for generating whatever tool is currently needed and an extensive neural system to allow independent decisions. In 2369 Lt. Cmdr. Data proved that Exocomps, due to this intelligence, had to be acknowledged as lifeforms (TNG: "The Quality of Life"). 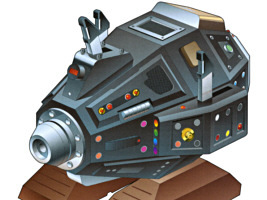 Exographic targeting scanner Head-mounted sensor with a monocle-like eyepiece that allows to view targets even through solid walls (DS9: "Field of Fire"). Exoscalpel Surgical instrument to incise the skin, exposing underlying tissue (TNG: "Ethics"). Exoskeleton Body covering of Borg drones. The exoskeleton serves as armor and is directly connected to the organic body (VOY).